Made of a shiny & durable laminated paper material .Handmade item.They are thin and bendable. This banner comes with 2 pieces of banners,each with 12 weapons.The string is approximately 7.5 ft.These banners come pre-assembled. 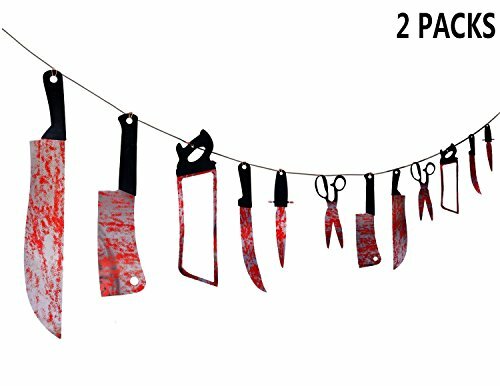 Features a variety of blood splattered horror prop classics, such as a butcher knife, hacksaw, and scissors! Used this as a prop for halloween in the kitchen,bathroom,backyard,porch and door,etc. So much evidence of heinous crimes are on display. Go crazy on the decors. Make it a premeditated awesome decorating with these Bloody Weapon Garland. These can be used indoors or outdoors, but best if they’re in dark and dank places. Hang this garland on your ceiling, on the windows, or between trees.